YCSB is a great benchmarking tool built to be easily extended by any driver which supports and implements basic operations like: insert, read, update, delete and scan. Plain synthetic data introduced by YCSB fits this paradigm perfectly. But when it comes to JSON databases queries became way more sophisticated: querying arrays and nestled objects, running joins, aggregations. The YCSB-JSON extension on one hand should be able to utilize all possible JSON operations supported by a database. On the other hand implementing this approach in YCSB should be generic enough to be easily extended by any other DB driver no matter what level of JSON querying it supports. The YCSB-JSON is designed to better emulate realistic, end-user scenarios. It designed to work on any JSON data either real datasets or pseudo-realistic or fully synthetic. And one of the requirements for the tool is that there shouldn’t be any hardcoded values in query predicates. User can only control the data cardinality during dataset generation process. The dataset is generated by using fakeit tool and loaded into a database (Couchbase, MongoDB) by external scripts. While model is defined and fixed values are randomly generated. This data is randomly generated but it’s not synthetic. Load generated data to a database by any external script. Run the YCSB load phase. During this phase the YCSB will read random subset of the generated documents, store all its values in its internal cache. During the run phase the YCSB will use the values from its cache while binding and executing queries against the database. The YCSB uses generators when operating with data. 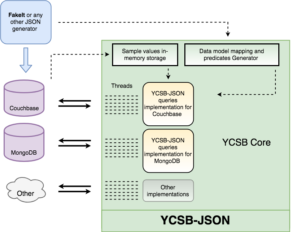 The YCSB-JSON introduces its own generator mapped to particular data model. The mapping and the model exists only within generator namespace. The generator output is a set of generic predicates (field-value pairs) for particular query. This allows to modify model and extend the tool with other queries without modifying rest of the YCSB core code. The query predicate is a field within an object. When using Couchbase N1QL the field can be simply accessed as “address.zip”. But other database might not be as flexible so YCSB-JSON generator creates 2 predicates: the parent predicate (address) and child/nested predicate (zip). And the child predicate has a value randomly picked from list of sample values for this particular field. The YCSB code needs to be updated with new operations. The DB driver function of a YCSB-JSON operation takes an additional parameter which is generator object. It is being passed by Workload class and it has a particular predicate sequence prebuilt. Because predicates structure and sequences are well defined by the generator a DB driver can access names and values directly and construct the query using its native query language or other access methods. Below are examples of implementing Page and Report queries. Implement fakeit-like generator in YCSB to simplify data and query predicates generation.